Bad Breath, Dental Hygiene, -Rancho Mirage - What Causes Bad Breath? Have you ever been afraid that you had bad breath? Maybe you are constantly chewing mint gum, or always keep a few mints on hand. Perhaps you've even resorted to hiding your smile because it would require you to open your mouth? While bad breath (also known as halitosis) is a condition that needs to be taken care of, it should never keep you from having fun. Let's take a look at some causes and natural remedies for bad breath. Bad breath can be caused by many things. Most of the time, it depends on what your oral health habits look like. Here are some things you want to avoid as much as possible in order to save your breath! Alcohol - Since the human body treats alcohol as a toxin, most of the alcohol is converted into an acetic acid, which causes bad breath in addition to tooth decay. Cigarettes or Cigars - The smoke left behind from cigarettes or cigars tends to remain in clothes or cars. The strong smell also lingers in our mouth, causing halitosis. Coffee - As good as it tastes, coffee can hurt your oral health in more ways than one. Besides staining your teeth coffee can leave a stench in your mouth that is hard to get rid of. Dehydration - When your mouth gets dry, it allows harmful bacteria to grow, resulting not only in stinky breath, but also in tooth decay. Garlic - You can usually tell if someone just ate something with a lot of garlic in it. Why? You can smell it on their clothes, on their skin, and yes not heir breath. 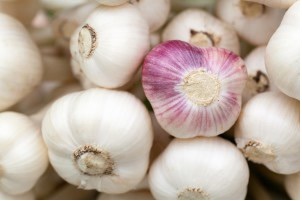 Garlic contains a sulfur-based compound called allylmethyl sulfide. This compound causes your breath to stink! Medications - It sounds odd, but some medications can actually cause bad breath. Drugs that dry out your mouth such as OTC antihistamines, decongestants, and diet pills can do the job. Also on the list of suspects are prescription drugs for depression and high blood pressure. Onions - Like garlic, onions contain the compound allylmethyl sulfide. For this reason, moderate the amount of onions you eat. Strong Cheeses - cheeses such as Roquefort, camembert or Blue Cheese can be very strong and can dominate your breath if you aren't careful. Chew spices, herbs and seeds - Some spices and herbs have been known to have antiseptic qualities that fight off bacteria. The chlorophyll of some herbs also works to neutralize odors. A great way to freshen up your breath is to chew a handful of each! Try chewing cloves,parsley, cinnamon, cilantro, basil, mint, fennel seeds or aniseed. Chew Lemon Rind - Just like spices, lemon rinds can refresh your mouth. The citric acid will help your salivary glands produce more saliva, which is great for rinsing your mouth of harmful bacteria. Just be careful about how often you do this, as acidic foods can cause tooth decay. Gargle Salt Water - Warm water combined with salt or hydrogen peroxide will help cleanse your throat and tonsils of bacteria. Rinse with Non-Alcoholic Mouthwash - Make this at home! Simply mix a cutoff water with a teaspoon of baking soda and rinse. Baking soda will help lower ph levels (keeping cavities at bay) and fight off unwanted odors. You can also try adding antimicrobial peppermint essential oil to this rinse - just don't swallow!! Use an Oral Irrigator - This hand held device shoots bursts of water through our mouth, helping free up any remaining plaque or bacteria you didn't get with your toothbrush. What if the reason you have bad breath is simply because you dont floss as much as you tell your dentist you do?? Use tea-Tree Oil Toothpaste - Tea-tree oil acts as a natural disinfectant that will help cleanse your mouth. If you suspect you may have one of the conditions listed above, speak to your doctor immediately. Dr. Lemay offers a range of treatments beyond enhancing your breath to restore the health and beauty of your smile. If you would like to learn more about your treatment options, we welcome you to schedule a consultation.